local BONNELL family in particular. this was the first genealogy book (PA's Pine Creek Valley, Kraybill, copyright 1991) that fell into my hands. from his book on-line (see below). Rhoda English Ladd and Helen Herritt Russell. There is a picture of Rhoda English Ladd on page 380 of Kraybill's book. for her outstanding contribution to Pine Creek History." Russell's book, "The Tiadaghton Tale: History of Jersey Shore Area and its People" is copyrighted 1975. Another book of local interest is "History of Little Pine Valley" by Harry Stephenson, Sr., published in 1992. "The Bunnell/Bonnell Family in America - Second Edition"
Names and Relationships of the Eighth Generation"
here, or here, are the next leaps. "The BONNELL Genealogy" by Sara Rebecca E. Spang, copyright 1992. L5. Display other BONNELL items collected, not nescesarily reltaed directly to me or this area. please contact me, Steven L Bonnell. Your Feedback please! as they become available and my time permits. is welcome to join in! (WITH permission, of course) of relatives. I'm already working with two distant relatives via e-mail! If you have information or want to help, please contact me. So I now have made the LINK from to the next Branch. G.R.B. is the son of Thomas. One of his cousins is looking for him/YOU! 14 Mar 98 - - We FOUND HIM! This will be a good story for the reunion! born about 1757(?) - don't know where. moved to Lycoming Co - Pine Creek Valley area - around Jersey Shore, PA.
moved to Erie(? 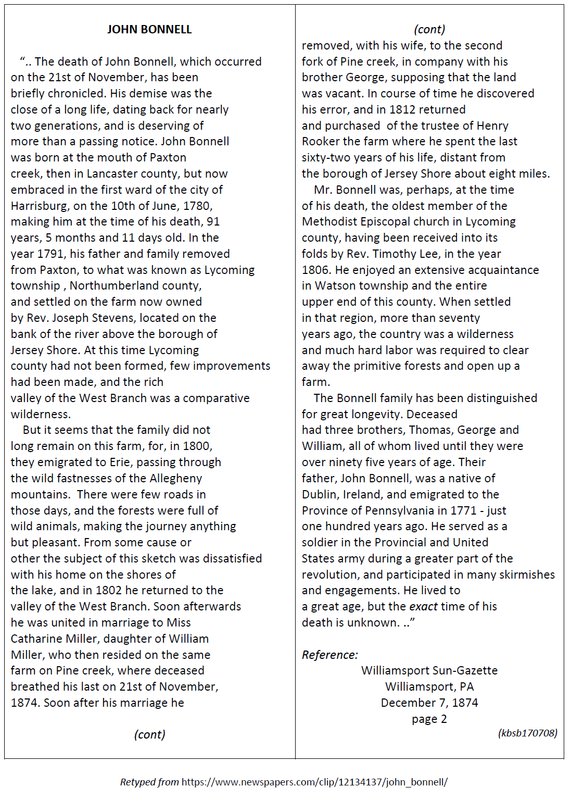 ), PA area, where he died 1845. ANY and ALL information -- and/or GOOD LEADS -- are welcome! - NOTE (17Jan98): This has been verified to be TRUE! 2. 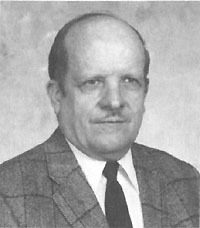 The ties from Benjamin BONNELL down to John Bonnell, Sr. These ties are based on entries in an old family Bible - but some of the info does not seem to agree with other published data. This is my SECOND target area to prove/disprove. contains a tremendous amount of information, some of which, with permission, has been referenced at this site. also visit my Other Links Page - for new stuff from time to time! 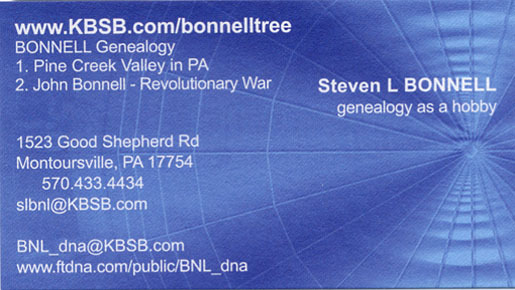 "BONNELL Family Tree, Genealogy, & Information".